Posted by The Way to Akhirah , 14:35:00 Be the first to comment! of mankind. The Qur’an Majeed describes this Night. one can actually measure the extent as to how much better it is. any people before this.” (Dur-Mansoor). the expense of sheer laziness and a few hours of extra sleep. i.e. 2lst, 23rd, 25th 27th or 29th night. service during the last ten days of Ramadhaan. 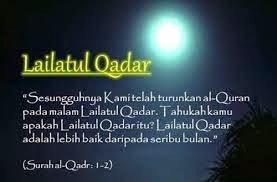 Tahajjud salaat, Tilaawat of the Qur’an, Dua, Zikr, etc. Allah reward us with His bountiful blessings. Aameen.